When the bison were exterminated from North America, indigenous populations lost an inch of height in just a generation. 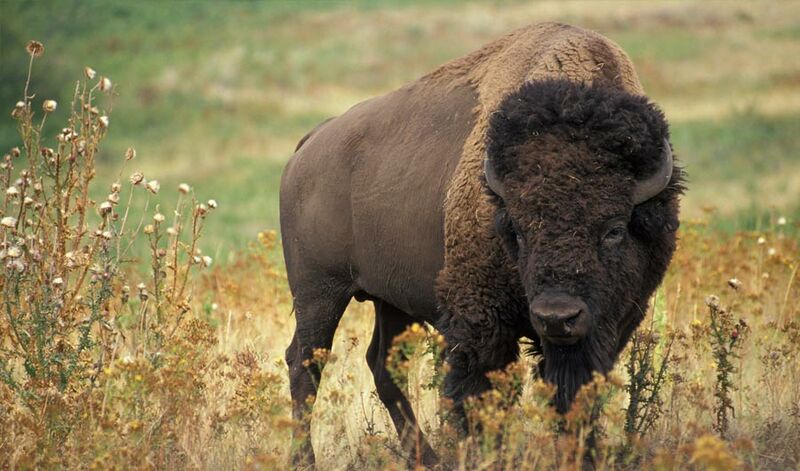 (Inside Science) -- In 1870, there were at least 10 million bison in the southern herd on the North American plains. Fewer than 20 years later, only 500 wild animals remained. That part of the story -- the bloody removal of the animals for hides, meat and to devastate Native American communities -- is well-known. We have countless movies, books and ballads about the dust-strewn slaughter. What hasn’t been so well-studied is the story of what happened next to the people involved. That’s the focus of a new report presented at the American Economic Association meeting in January. The researchers claim that the rapid destruction of the bison created an equally dramatic decline in the heights of the Native Americans who depended on them -- and a worse per capita income that persists today. “You could imagine what would happen to certain sections of the American economy if oil disappeared, and people had no alternative,” said Donna Feir, an economist at the University of Victoria, Canada. Now, imagine that these people couldn’t migrate to other economic activities, and were kept in certain locations for 50 years. It would be a cultural and economic bomb that would continue for decades. Before the bison disappeared, the native people living in the plains were among the tallest in the world. They didn’t diversify their work from a single resource, the researchers said, because the bison pretty much supplied them with everything they needed. They were at least as well-off as European colonists at the time, researchers have argued. “The idea of poverty coincides with the reservation era, which happened after the slaughter of bison,” said Feir. The slaughter changed everything. It happened in two waves. The first came slowly: European settlers brought cattle with them, and those animals competed for land with the wild bison. The second started in the 1870s, after German leather-makers created technology that allowed bison hides to be tanned more efficiently and economically. During 1871 and 1872, an average of 5,000 bison were killed every day, as thousands of hunters poured onto the plains. The slaughter continued until 1889, when only about 85 free-ranging bison remained. In just a generation, the height of the Native American people who depended on bison dropped by an inch or more, as measured by physical anthropologist Franz Boas, who collected data on the height, gender and age of over 15,000 Native Americans between 1889 and 1919. Groups that experienced rapid bison extinction had an even more precipitous drop -- children born after the slaughter were up to 2 inches shorter at adulthood than those born before the slaughter, the researchers found. Population declined, as well. And what the researchers called a kind of cultural depression settled on bison-dependent groups. Feir pointed out that the drop in height wasn’t as steep for women as it was for men -- perhaps because traditional women’s skills, like making clothing -- were more adaptable to new locations and animals. While men’s traditional skills could have transferred to cattle ranching, government regulations forced people onto reservations where that was not an option. The researchers found that even today, formerly bison-dependent societies have between 20-40 percent less income per capita than the average Native American nation. The economic shock effects of the end of bison culture -- and its particular shock effect on men -- didn’t surprise Dan Flores, a New Mexico-based historian who specializes in the American West. He said he was intrigued and impressed by the research’s ability to compare economic effects over several generations. He also suggested that the decline of the bison actually began to affect tribal economies and cultures a half-century before the endgame of the 1870s and 1880s -- only a small handful of groups were in places that experienced the precipitous drop. Flores also believes that the U.S. government wasn't the only factor to blame for the bison’s decline. “I argue that climate change, accidentally introduced bovine diseases, competition for grass and water from burgeoning horse populations, but most of all the effects of an unregulated market brought bison down,” he said, both in the U.S. and in Canada. Feir pointed out that there were a lot of restrictions on Native Americans around this time. Native people didn’t gain full citizenship in the U.S. until 1924. “Society viewed them as an enemy,” she said. Taking away bison from people dependent on the animals drove them to shorter bodies and poorer lives, she said. Today, an estimated 500,000 bison roam North America, on private and public lands, a far cry from their peak population, but much larger than their 19th-century nadir.